If you are in need of bee removal in Ocean Beach, our bee removal experts from D-Tek Live Bee Removal can help. We specialize in the safe, humane live removal of honey bees from your Ocean Beach home or business. We utilize a state of the art bee removal vacuum system to gently remove the honey bees. We then transfer the honey bees into a bee hive box. From there we drop the honey bees off to our own bee farm in San Diego . All of our bee removal technicians we have are pros at what they do and are very thorough from start to finish. We set the bar high! By choosing D-Tek Live Bee Removal you can be assured that your bee problem in Ocean Beach will be taken care of quickly and professionally. All of the above-mentioned steps are very important in the live bee removal process. There are two steps that stick out above the rest. The first one being the complete removal of all beehive and honeycomb. If any beehive is left behind in the structure it will be a magnet for common household pests. If any beehive is left behind in the structure it will be a magnet for common household pests. These pests include ants, mice, rats, etc. Another problem with leaving the bee hive inside of a structure is that once the honey bees are no longer there to tend the beehive often times the honey will melt out and can cause damage to your Ocean Beach home or business. These damages can include stained drywall, stained stucco, stained siding, damaged electrical wiring, damage to wood framing, etc. Honey bees have an excellent sense of smell. 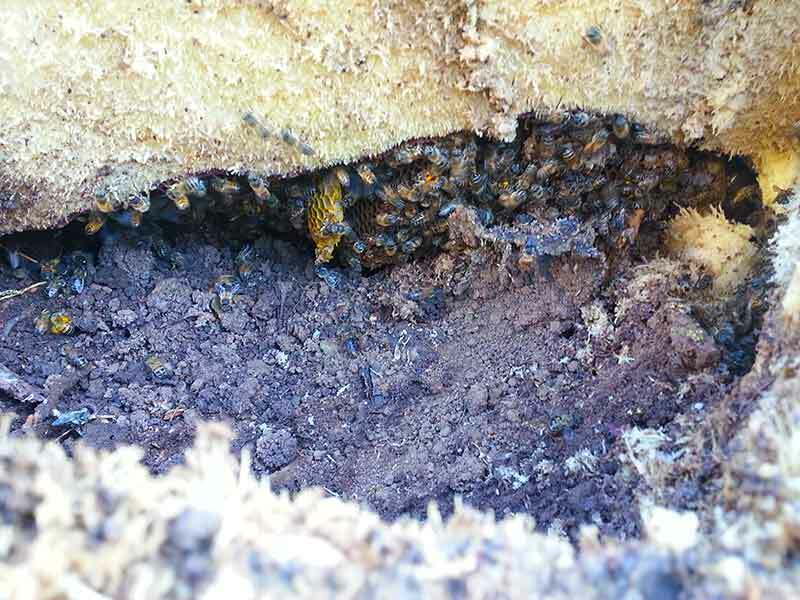 If a beehive is left in a structure you will have a lingering bee problem for years to come as the smell alone will draw other bee swarms in the area to your Ocean Beach home or business. There are many pest control companies in San Diego that will show up to your door and simply exterminate bees. This is a cheaper option in the short term. However, you will run the risks mentioned above. More often than not it is not a cheaper option to exterminate or leave a beehive in a structure in the long run. Save yourself a headache and time. Have D-Tek Live Bee Removal get your bee infestation taken care of properly the first time. The second very important step in the process is the bee removal repair work. Honey bees most commonly build bee hives in attics and walls. In most cases it is necessary for us to cut into your roof, drywall, stucco, or siding to fully remove all of the honey comb. D-Tek Live Bee Removal stands behind all of our repair work. We offer guarantees that all roof, stucco, and siding repairs will be leak free. All drywall repairs will blend with the surrounding area. We know it can make home and business owners nervous when it is needed to cut into a roof, siding, or stucco. We are not only bee hive removal professionals but also construction repairs professionals as well. We perform thousands of repairs in San Diego County each year without incident. After the bee hive removal has been completed and any bee removal repair work performed it is time to make sure the honey bees can’t reenter the same area again. We call this bee proofing or bee control services. One of our expert technicians will go over every crack , vent, crevice, hole, in a 10 foot radius from the original entry/exit point. We seal up very tight to make sure you won’t have a bee problem again. D-Tek Live Bee Removal also offers whole home or business bee control services in Ocean Beach. Have one of our bee proofing experts inspect your home or business and then patch every crack, crevice, hole, vent, irrigation box, light fixture, etc. We guarantee in writing that you will not have a bee problem again at your Ocean Beach home or business. Do you want your bee problem in Ocean Beach taken care of quickly, safely, and professionally? Give D-Tek Live Bee Removal a call today to set up your free estimate and inspection. Our direct line is 760-224-3040. If we do not answer please leave a message and we will call you back as soon as possible. At times we do experience high call volumes. We can usually get back to within thirty minutes. Don’t feel like calling simply email our bee removal experts. Leave your name, number, and a brief description of your bee problem and we will contact you shortly. We can usually have your Ocean Beach beehive removal completed within 24 hours of first contact.